I used to be afraid of spiders, would not go down into the basement unless accompanied by another human larger than me, because spiders lived in the basement. But why fear a creature that suspends itself in mid-air, magically hiding the ropes. It’s delicate and graceful and I’m told those invisible ropes lasso other less beautiful bugs and things with wings. So here is proof that I am no longer afraid of spiders. Here is one right next to my computer. I had to get pretty close with my iphone to photograph this guy (gender uncertain). I’m ready for the shiva, photos chosen and pasted on cardboard that will stand on the dining room table, seat cushions cleaned, hours set. Of course I may return to Cleveland for the shiva. That’s the big unknown—how I will feel and react when the final curtain drops. I can’t rehearse that. My mother is 92 and suffers from advanced Alzheimers. She was diagnosed at 80. Yesterday I read somewhere that 50% of us who reach 85 (count me in) will suffer from Alzheimers. My chances are good, so I’ve been taking large doses of coconut oil, leafy green vegetables and tomorrow I will start brisk walking for forty minutes three times a week. I should do crossword puzzles, but I can’t tolerate frustration. Praying wouldn’t hurt, either. There must be a connection between the spider in my room, suspended and stationary, my mother and Alzheimers. I don’t have time to figure it out right now, but if you can, please leave a comment below. Coming soon in your inbox: Writeinisrael’s Photo Quiz to Celebrate the 46th Anniversary of the Unification of Jerusalem (“Outrageous, hilarious, banned by The Jewish Agency”). 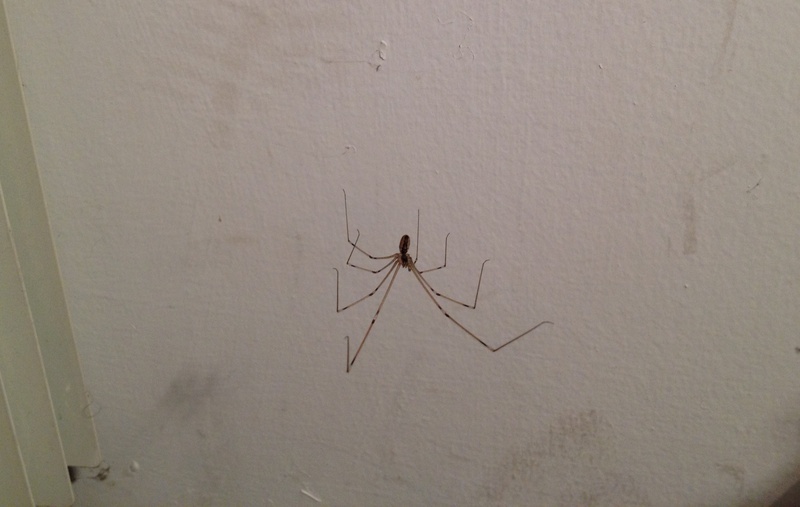 This entry was posted in Uncategorized and tagged afraid of spiders, Alzheimers, died twice. Bookmark the permalink. Maybe it is you seem to have forgotten your fear of Spiders..let’s hear it for forgetting our fears, which for many of us baby boomers at this moment, seem to be related to aging, alzheimers and quality of life somewhere out there in the not very distant future. Thanks as always, Judy, for your humor, your perspective and for sharing what is really on your mind. Ahh, wonderful idea, Jane. Forgetting some things, like our fears, is positive. The solution to spider phobia is to read “Charlotte’s Web.” Worked for me! Having to part from your mother three times — actually more because of her gradual decline with Alzheimer’s — must be agony for you. I don’t know what’s in store for me down the line; my mother died when she was 16 years younger than I am now. My only antidote to fear of ageing is to count each healthy day as a blessing. I do my share of grumbling, but I consider each day that I can get out of bed as a gift. Sounds mushy, but it’s real. I like how your little story manages to go in so many directions and give us so much to think about. Memories of the past and the change from then to now, plans and worries about the future, the mysterious lives of creatures and people, love and connection. Thank you for another gem. Thanks so much, Shosh, for showing me the connections. It’s good to laugh, Tzirelchana, after so many years of crying. a post to remember Judy!